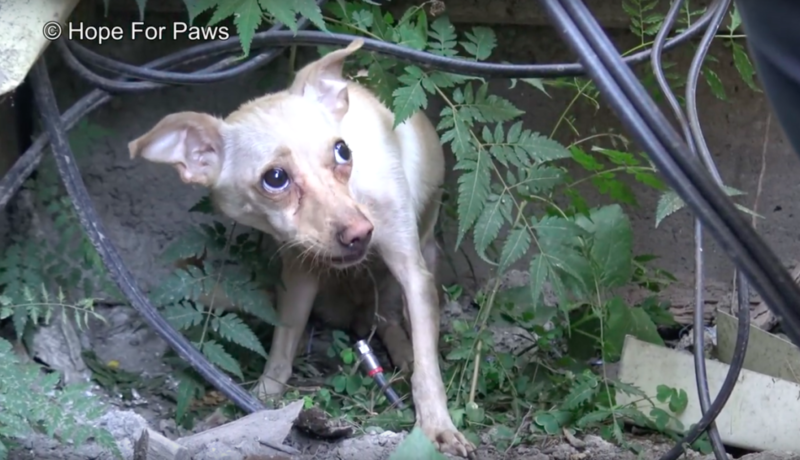 Hope For Paws received a call regarding a homeless Chihuahua who was alone on the streets and absolutely terrified. 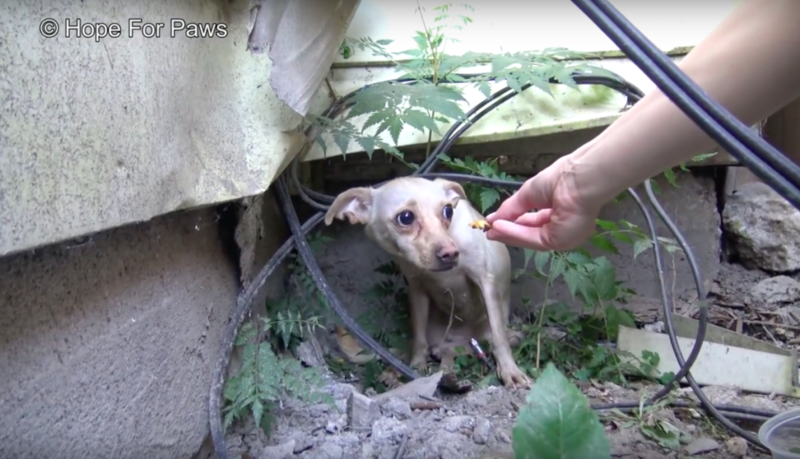 When rescuers arrived, they secured the area with fencing so the nervous Chihuahua wouldn’t be able to run away from them. One of the rescuers, Loreta Frankonyte, slowly went up to the dog to try and befriend her. She offered her some food, but she wouldn’t take it from her hand. She tossed it on the ground and she reluctantly gobbled it up. When she offered another piece of food, she finally took it from her hand. She took a few more pieces, but when Loreta went to pet her, she snapped at her. She was still visibly afraid and didn’t understand yet that these people were there to help her. Eventually they slipped the snare around her neck and gently pulled her out. They thought it would be better if she didn’t feel cornered anymore. Once they got her out, they put the leash on and spent time with her to make her feel safe. They named this adorable pup ChiChi. She finally allowed them to pet her and began to trust them. They scanned her for a microchip, but unfortunately she didn’t have one. They brought her back to their clinic where they gave her a warm, much-needed bath to wash off all of the filth from living on the streets. She was still nervous at first, but after a while, her personality began to show. She was actually a very friendly and sweet dog. A week later, she went to live in a foster home with another one of Hope for Paws’ rescues named Washington. The two of them got along great and were the best of friends in no time. ChiChi is available for adoption. She is a very affectionate dog who loves to give kisses. She also gets along great with other dogs. If you’re interested in giving her a loving forever home, contact http://www.PawPrintsInTheSand.org.